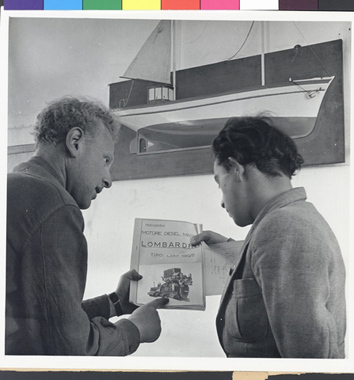 JDC - Archives : Two members of the Hanoar Hazioni fishery discussing ship engines. Title Two members of the Hanoar Hazioni fishery discussing ship engines. Description Mr. Mundek Kramer, from Stanislav, Poland, shows another member of a Hanoar Hazioni fisheries and seamanship training center (Hachsharah) the type of engine to be used on the boat they are building, a model of which is in the background. The boat is made entirely by Jewish refugees, training in a JDC supported facility for a life in Palestine.